National Tax Number Certificate, which is issued by the Income Tax Department on filing of application form accompanied with one attested copy of NIC. Commercial exporter is not required to register with Sales Tax Department. But if you pay the sale tax on the goods from local market it will be better for you to get yourself registered with sales tax department so that you may claim your input tax deducting on your purchases. Once you are registered in sales tax department you will be obliged to the monthly sales tax return irrespective of the fact that you have been involved in any sales tax activity or not. 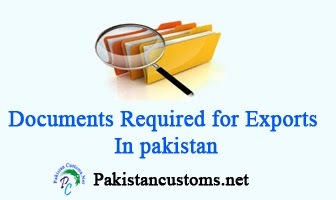 Current Bank Account is required for export proceedings and documents. Membership certificate of Chamber of Commerce and Industries or any relevant trade association is required. Once the consignment, to be exported arrives at the port, usually a clearing agent services are sought. The following documents are required to provide to clearing agent to clear the consignment. i) Packing List. iii) Letter of Credit (L/C). iv) Certificate of Origin which is issued by Chamber of Commerce. v) National Tax Number Certificate. Note: Now online Electronic Form-E filling system in WeBoc have launched, all export goods declarations through Weboc always be submitted and completed by compulsory filing of the electronic E-Form. Form “E” (State bank form): All exports from Pakistan which are subject to Foreign Exchange Regulations are required to be declared on form „E‟ which is in sets of four copies each. The exporter should submit the full set of Form „E‟ to the bank after it has been completed and signed by the exporter himself or his authorized agent. While certifying Form „E‟, bank should ensure that exporters give only one address in Form „E‟. After the form is certified by the bank, it should be submitted to the Customs/Postal authorities at the time of shipment along with the shipping bill. The Customs authorities will detach the original copy and after filling in the portion relating to them and affixing their seal and signature thereon forward it to the State Bank. The Customs authorities will return the duplicate, triplicate and quadruplicate copies to the exporter or his authorized agent who will retain the quadruplicate for his own record and submit the duplicate and triplicate copies to the Authorized Dealer along with the shipping documents within 14 days from the date of shipment. 7) Submission of Export Documents to the bank. All shipping documents covering goods exported from Pakistan and declared on form „E‟ must be passed through the medium of bank within 14 days from the date of shipment. The exporter must submit the duplicate (bearing Customs seal and signature of Customs Officials with Code number) and triplicate copies of form „E‟ along with the shipping documents, invoices etc., to the bank who had certified the form „E‟. An extra copy of the shipper‟s invoice must be attached to the triplicate copy of the form „E‟.